Pickup from Delhi Airport / Railway Station and depart for Haridwar. On arrival Haridwar transfer to your Hotel. Visit Har-ki-Pauri to take Holy Bath & to see Ganga Aarti in evening. Drive back to your hotel. Take Dinner & Overnight stay at Hotel. DAY 02 : HARIDWAR – GUPTKASHI (220 KMS / 8-9 HRS) HEIGHT : 1319 MTRS. DAY 03 : GUPTKASHI – KEDARNATH – GUPTKASHI (30 KMS BY ROAD & 19 KMS TREK ONE WAY) HEIGHT: 3553 MTRS. Morning after breakfast, drive to Badrinath. Check in to the hotel arrival in Badrinath. Pilgrims after having a bath in the Taptkund have the Darshan of Badrivishal & Aarti in evening. Brahamakapal is significant for Pinddan Shraddh of ancestors (Pitrus). There are other interesting sightseeing spot like Mana, Vyas Gufa, Maatamoorti, Charanpaduka, Bhimkund and the “Mukh” of the Saraswati River. 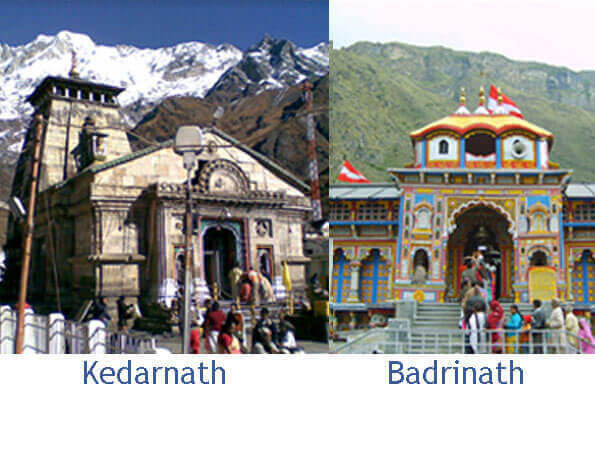 Badrinath are spreader out in only 3 Kms. DAY 05 : BADRINATH – JOSHIMATH – RUDRAPRAYAG (160 KMS / 7 HRS.) HEIGHT: 1890 MTRS. DAY 06 : RUDRAPRAYAG – HARIDWAR (165 KMS / 5 – 6 HRS.) HEIGHT: 895 MTRS. Morning after breakfast, drive for Haridwar via Rishikesh. Rishikesh ‘place of sages’ is a celebrated spiritual town on the bank of Ganga and is surrounded by Shivalik range of the Himalayas on three sides. It is said that when Raibhya Rishi did hard penances, God appeared by the name of “Hrishikesh” and this area hence firth came to be known as Rishikesh. Check in Hotel. Later visit Rishikesh Temples & Sight Seeing – Laxman Jhulla, Ram Jhulla. Overnight stay at Haridwar. Morning, after breakfast check out from hotel and drive back to Delhi. On Arrival Delhi, transfer to Railway Station / Airport.